1. Bring your SU! catalog along on the first boat ride of the season in case the motor dies and you spend an hour adrift. 2. Do not leave your SU! catalog on shore when you go back on the boat the next day thinking there will be no time to read because the motor couldn't possibly conk out a second time. 3. Browsing the SU! catalog on your porch during an afternoon thunderstorm is a good idea. Leaving a metal rake and shovel propped up against the front of your camp is not. 4. No matter how many times you re-add and revise your SU! order from this fabulous new catalog, it will be at least twice your original plan - just go with it! 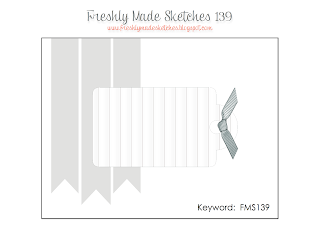 Tag your design at Freshly Made Sketches this week using Rita's fun sketch! My card features a sentiment from the new Hostess Set Hello There and wonderful background dots from Work of Art. I used the fab colors at The Card Concept to complete my design! Love your card and the colors too. I also totally relate with #4 on your list.... OMG... I have a sickness when it comes to stamps! Well.....I am quite intrigued about the metal utensils in a thunderstorm. Are you going to share? And I am right there with you about the boat, motor, catalog, etc. Been there, done that! And I haven't put in my first order yet because I CAN'T DECIDE WHAT TO GET!!! So many choices! I do love the soft colors you used on your card....very pretty! And a great sketch too! Oh my! I can't stop laughing! You are such a hoot! First, your card is adorable and so crisp and clean! I love the colors! Second, I too, am very interested in learning about the rake in the storm. But really? the best is having your motor conk out twice? who would ever think that? Laughing and laughing... although you may not think it's funny, but we do! :-) Hugs! Hahaha! Thanks for the chuckle. I love it! Your card is lovely...I am looking at this catalogue and love it all! Super pretty with the lighter yellow! This card is so fantastic, I don't know what to say about it! The ribbons in place of the flags is pure genius! And they're so artfully arranged! Well, I'm so glad your catalog wasn't near the rake and shovel when the lightning hit! Your card is beautiful. I love the custom-made dsp and the creative way you've used the ribbons. This cardinal is absolutely beautiful!!!!! What a fabulous card, Linda! Love the colors, the dotty stamping and those whimsical ribbons! Thank goodness the catty didn't end up in the water! The colors on this card are just so soft and pretty Linda. Fab card! That was one of the funniest things I've read Linda - you are hilarious! Love this card and the soft colours you've used! Great advice! I love your ideas about all the opportunities to browse the catalog, and I love your card. The colors are so pretty, and I love the fresh, contemporary look. Linda this is so pretty. 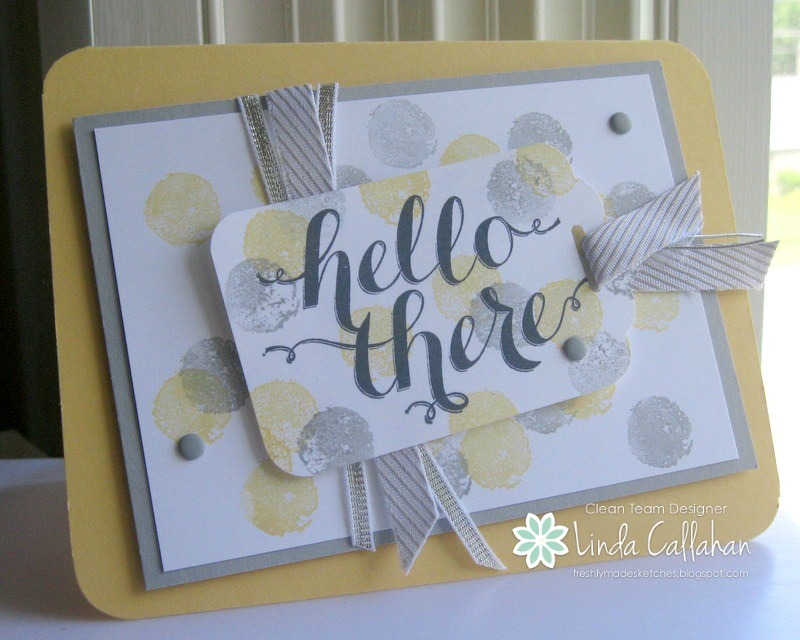 I'm a big fan of polka dots so you won me over with this one:) So glad you were able to join us at The Card Concept. I'm just glad that all is well and that your humor is intact!! Yikes….twice!! You clearly earned a bigger than expected order. Cute card, of course! Yikes! I am not sure I'd be up for camping or boating after all that. I hope it behaved better this weekend. This card is Fabulous with a capital F! So, so pretty. I love all the circles. Love this card Linda! 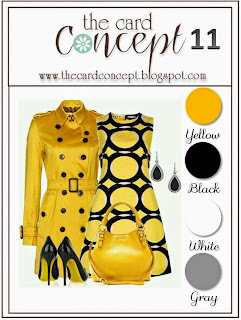 I love yellow and grey together and they looks just fabulous together here! I love those stamps!!! Super fun!!! Hope the boat gets fixed soon!